Mr. Reader is an RSS reader for the the iPad developed by Oliver Fuerniss that syncs with your Google Reader account, keeping you up-to-date with all the latest RSS feeds from your favorite news sites and blogs. We live in a highly – technological age; gigabytes and gigabytes of data gets transferred in a blink of an eye. In fact, in today’s world, information is so vital in our daily lives that it is not about who gets the information anymore, but who gets the information first that counts. And, with the meteoric rise of the social business model, people have new ways of sharing the information faster, and to a much wider audience than ever before. RSS technologies (originally RDF Site Summary, but often dubbed as Really Simple Syndication) is a result of this need to rapidly transfer data from source to audience. In a nutshell, by creating standard web feed formats that can be used by many programs, publishers of data on the web can allow users to access data updates of their choosing without manual checking each of publisher’s individual sites. Coupled with social media sites and platforms such as Twitter and Facebook, data exchange globally has never been easier. Having those said, with the inherent immense capabilities of the iPad, it is no surprise that the iPad can really server as an excellent RSS reader. Also, due to impressive “screen real – estate” and “high multimedia capabilities” of the iPad, iOS developers can create RSS Readers that are both functional and fun to use. And they did. We now see a lot of RSS reader applications, with varying features ranging of very simple RSS readers, due elaborate highly graphical interfaces. So does Mr. Reader fit it? Mr. Reader, developed by Oliver Fuerniss, is a full featured RSS Reader with just the right amount of functionality and fun factor. 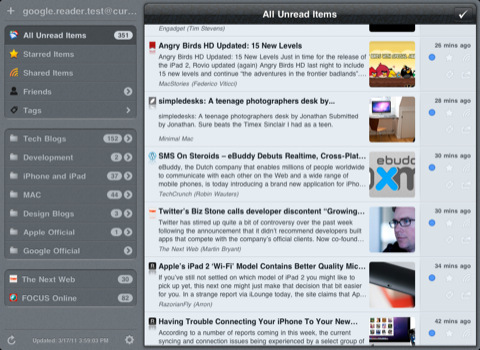 Upon opening the application, the user is presented with all the necessities and tools you would expect a RSS Reader. Mr. Reader has a clean and siple UI wherein the all of you RSS feeds are grouped on the left, then a preview page is seen on the right. Mr. Reader, just like all RSS readers, allows you to sync your Google reader account. This makes organising and managing your RSS feeds between multiple devices easier. All the usual features such as adding additional feeds, starring individual feed articles, organizing feeds into folders, etc. are all here. But the real magic of Mr. 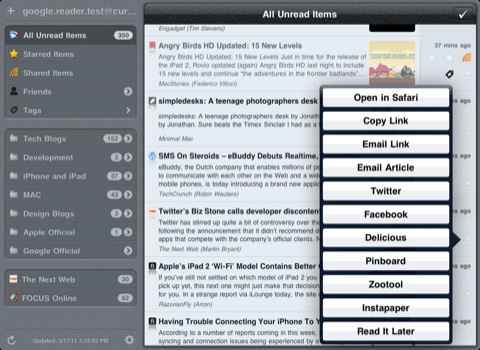 Reader is that it has almost every imaginable way of sharing and viewing your RSS articles. Mr. Reader has a complete set of tools that allow the user to share the RSS article or content that he / she is reading to almost every service imaginable, (e.g. Diingo, Twitter, Facebook, Email Article, Email Link, Evernote) and offline viewers. (Read It Later, Instapaper) Because of this, you can be almost assured that you can reach out and share that important content to your intended audience fast. Mr. Reader does allow the user to chose which service is available when, so don’t worry about being crowded with many unwanted services. The other top notch feature of Mr. Reader is that it allows the user to view the RSS article in a multitude of ways (RSS, Web, Mobilizer and Readability) without leaving the main article window. This is a God – send feature. Now a user can quickly switch between between the views simply by clicking the view that he / she wants. No more opening links in Safari, or waiting for long download times for your RSS article. You control the data that is shown. I really cannot stress how good and fluid this is until you experience it first hand. Bottom line: Mr. 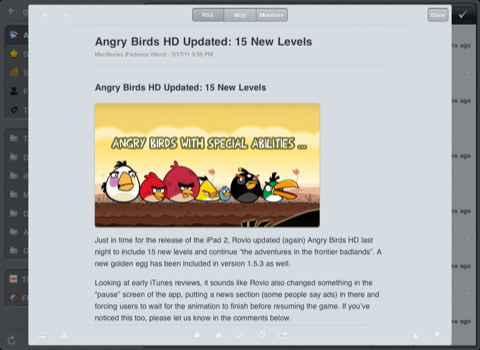 Reader is a good RSS reader for anybody looking for one. Its numerous in-app services for sharing and RSS app customization is good, but sometimes sluggish app performance ruins what could have a perfect experience. Pros: – fully featured RSS Read with multiple services. – sluggish performance when numerous RSS articles are updated. AppSafari review of Mr. Reader was written by John Tinio on July 13th, 2011 and categorized under App Store, Featured, Feeds, iPad apps, News, Reading. Page viewed 4469 times, 4 so far today. Need help on using these apps? Please read the Help Page.